Shipping Details Free estimates for repairs are available except for insurance claims. In order to make an accurate estimate, we must be able to do an in-hospital exam on your doll. 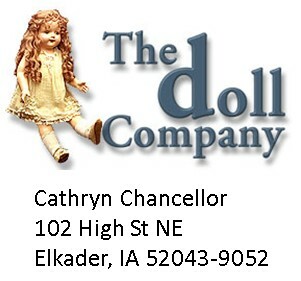 To have your doll repaired or an estimate given by The doll Company, print the repair request form and fill out all of the information. If sending more than one doll, please complete a separate repair request form for each doll. In addition to quoting on the work that you request, we may suggest other improvements or nice things we can provide for you such as clothes, wigs, shoes and socks, etc. Place your undressed doll (unless we are cleaning the clothes also) and form in a sturdy box. Clip and tape the mailing label below to your package to send your doll to The doll Company via UPS or insured mail. Insurance is highly encouraged. We'd like your keepsake item to reach us in the same condition it was packed in. Need help? Here are links to our preferred couriers with some tips and instructions on proper packing. For more information call 281-362-5006. Fees for repairs or restorations are due at the time the order is placed. Acceptable forms of payment are Visa, Mastercard, Discover, Paypal, and debit cards. If you can not pay at the time of the order, we may be able to make arrangements. To simplify shipping, we encourage you to use this pre-made shipping label at the very bottom below so your package reaches us in a timely manner! Please type in the requested information below, then print, and ship!